One of the biggest cities in the state of Ohio, Cincinnati has a fascinating history and was actually the first major inland city in the entire United States. Home to beautiful architecture, major sports teams, fascinating cultural landmarks, and exciting annual festivities, Cincinnati is a bold, vibrant city with a lot to offer. The city attracts plenty of visitors keen to see the sights, sample the local cuisine, and enjoy the stunning cityscape, as well as taking in the various parks and waterways like the Ohio River and Little Miami River. With those great waterways and several other bodies of water in and around the city, Cincinnati is a great place to enjoy some kayaking. Regardless of your experience or ability level, the city’s waters offer some spectacular views and opportunities for kayakers of all ages. Just a little drive outside downtown Cincinnati is the Miami Whitewater Forest. Kayak rentals are available in this scenic forest with several lakes and waterways all suitable for kayaking. Beautiful surroundings provide the ideal backdrop for an enjoyable kayaking session with friends and family at this popular park. The Little Miami River is another super kayaking location just by Cincinnati. Running for over 100 miles through the southwestern section of the state of Ohio, the Little Miami has plenty of great launch points and kayak rental opportunities, as well as lots of little parks and places to stop off for snacks and more along your kayaking route. The waters along this river can be quite calm and flat, so it’s a great place to simply relax and take in the scenery without needing to spend too much effort paddling and negotiating the river itself. Various kayaking companies can be found in and around the city of Cincinnati. Some of them simply offer outfitting services and rentals, while others will offer fully guided kayaking expeditions along waterways like the Ohio River and Little Miami. Here are some of the top rated kayaking companies one can found in Cincinnati. For a peaceful, relaxing kayaking experience in Cincinnati, sign up for a guided tour with Scenic River Canoe Excursions. 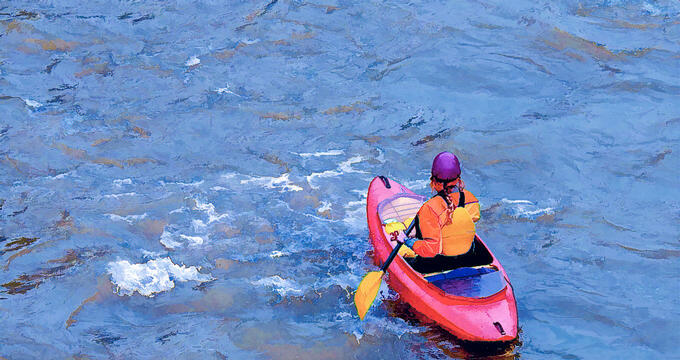 Focusing exclusively on the Little Miami River, this company offers low priced kayaking services on one of Cincinnati's calmest and prettiest stretches of water. Run by two passionate paddlers, Scenic River Canoe Excursions offers canoe and kayak rentals at great rates too and will be happy to organize group outings for schools, work groups, and more. For a full-fledged kayaking adventure in Cincinnati, River Dogs is a great place to start. This kayaking company runs a huge range of kayaking activities and services including rentals, guided tours along the Little Miami, kayak fishing, camping trips, and more. In short, if you want to have some fun along the Little Miami, this is a great company to choose and, as the name suggests, dogs are welcome on board these kayaks. Tippecanoe and Kayaks Too is a friendly, professional kayaking and canoe company operating on the the Great Miami River, just a little drive west of Cincinnati. This company runs kayak rentals as well as group events and, most importantly, guided kayaking tours. These tours are available on any day of the week and set off along the Great Miami, with experienced guides leading the way and sharing fascinating information about the river and surrounding areas. It's a great value trip and can last for almost a full day of paddling fun depending on the speed of the group.